Published in Business Development on 08/31/2017 by Harry Lew, Chief Content Writer. Don’t you wish you had a dollar for every book that’s been published about how to succeed in sales? Or for every sales concept or system developed to make you (and their originators) wealthy? Or for the mountains of sales collateral created to lead prospects to the close? No doubt you’d be rich. However, in reality, the secrets to sales success are timeless and simple . . . readily available for free to anyone who seeks them out. The KASH success formula is a great example. 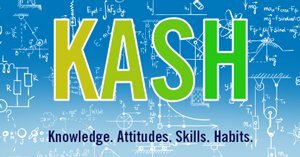 Developed decades ago by LIMRA, the life insurer trade group, KASH stands for Knowledge, Attitudes, Skills and Habits. LIMRA encouraged new agents to develop their abilities within each KASH element to achieve a fast start. Over time, the formula has spread to other areas of insurance sales and also to the business world in general. You might argue it’s old fashioned and hackneyed. We’d argue it’s a highly effective classic. The beauty of KASH? It’s easily remembered, simple to work on and a powerful organizing principle for self-development. Let’s dive in to see how KASH grows. Then we’ll discuss what we mean by the KASH Box. Knowledge is everything you know about the world and the people and things in it. Some knowledge is theoretical (how photosynthesis works), and other knowledge is practical (how to water a plant). In the insurance business, your understanding of how life insurance or annuity surrender periods work is knowledge. So is your sense of the best way to calm down an angry client. But, and this is a big “but,” knowledge is not action. You may have a lot of theoretical concepts in your brain. But if they never get used, they’re worthless. What constitutes a target market and which one or several will you focus on. The most effective techniques for generating leads. Which tactics work best for approaching a prospect. The process for assessing needs for insurance or other financial products. The method for determining a prospect’s risk profile. The procedure for making sure your product recommendations are suitable. The most common prospect objections and how to respond to them. How to close a sale. Which products to make available to your target prospects. How the products in your portfolio work in terms of features, benefits, fees, etc. How to manage the underwriting/new business process. How to structure your time on a daily basis. How to use your laptop and/or desktop computer. How to manage your cash flow and track your financial progress against goals. How to assess your key sales ratios and make necessary activity adjustments if you’re off track. We could go on, but you get the idea. The point is, think hard about what you need to know to be successful. Write down all the elements. Then develop an action plan to acquire that knowledge. Now, let’s move to the next component in the KASH Formula. Attitudes are ways of thinking or feeling about someone or something. In effect, they are the frames we place around the people and events of our lives that give those elements meaning. They also help to determine our response to those things: positive, negative, indifferent, energized, paralyzed, etc. Attitudes are crucial because they either unleash the use of knowledge via actions or prevent its use. The belief that your major goal in the business is to sell. But that the only way to do that is solve client problems. The belief that you are running a real business, not a vanity project, and that only you are responsible for its ultimate success. The acceptance that planning determines success at every level—year, months and days—and that the old saw is true: You need to plan your work and work your plan. The attitude that the telephone is an enabler of success, not an instrument to fear. The recognition that starting any new business, especially one in financial services, requires an incredible amount of work. Your commitment to do whatever it takes to succeed will largely determine whether or not you succeed. The belief that doing business the right way—ethically and in full compliance with state and federal rules—is the best path to sustainable success in this industry. An important exercise in terms of attitudes: do a self-assessment of your business belief system. Consider whether your attitudes are moving you forward toward your goals or holding you back. Then work to reinforce the former and jettison the latter. How to call a referred lead in order to get an appointment. How to use your firm’s first-interview fact-finder in order to identify and prioritize client needs. How to walk a prospect through a sales presentation in a way that arouses interest and creates urgency to act. How to respond to prospect objections to buying life insurance. How to explain the importance of truthfully answering life insurance application questions. Developing your skills in an important part of your development as a professional. Where to start? Read up on your desired skills so you understand what goes into them. Then find suitable role models either on video or in real life. Watch the person perform the skill repeatedly until you internalize it. Then try it on for size with someone watching you. Finally, get feedback on how you did and then try again. Habits are settled or regular tendencies or practices, which, because they’re so ingrained, are easy to sustain. Over time, habits are the behaviors you perform almost without thinking about them. They are your guarantee that the progress you’ve made implementing your knowledge and skills won’t disappear over time. In short, habits have your back. How to implement your skills on a consistent basis? Start with one or several. Build implementation into your calendar or activity management system and then take it a day at a time, trying hard to use the knowledge or skill and watching for positive results. When you get the latter, reward yourself, and then add another item to develop into a habit. So there you have the four elements of the KASH Formula. But what is KASH Box? It derives from the notion that the easiest things you can do as a new agent or advisor is learn sales, marketing, or product concepts (knowledge) or master the execution of tasks (skills). However, the hardest challenge is doing those things with the right underlying beliefs (attitudes) and for long and hard enough so they make a positive impact (habits). Agents who primarily focus on knowledge and skill performance tend to become average or commodity-level producers. They are, frankly, run of the mill. But advisors who go the extra mile to be sure they execute with the proper beliefs (attitudes) and then stick with it until they achieve their goals (habits) become the true winners in the business—long-term superstars (habits). This dynamic is illustrated in the KASH Box diagram below. View the top left and bottom left boxes (Knowledge and Skills) as the foundational elements to your success. Yes, they’re important, but they won’t get you where you need to go. The top right and bottom right boxes (Attitudes and Habits) are the true drivers of your success—your KASH Box. They help you derive the most benefit from your knowledge and skills, assuring you have the biggest impact on others—and deliver the greatest ROI on your knowledge and skills. In conclusion, we encourage you to keep reading and learning about the art and science of selling financial services. By all means, buy new books about sales when they come out and experiment with new selling systems. But also leverage the tried-and-true concepts that have empowered generations of agents in the past. Sometimes the oldest and simplest guidance is really the best. Good luck growing your own Kash Box!